​Opti-Coat Pro is a hard wearing, ceramic clear coat that will not wash away, or break down over time.It bonds permanently with the factory coating. A single layer of Optimum Clear Coating is more than 100 times thicker than a wax layer. Your car is a prized possession, so you invest in keeping it in pristine condition. ​ It’s a labor of love, but it certainly can feel laborious. During a routine wash the dirt and grime may seem never to come off. Then it feels like the day after a good wash your car is as dirty as it was the day before. You just waxed it last month, but now you’re having to reapply another sealant. What if there was a product to reduce the frustrations of keeping your car clean; a product that would keep your car cleaner for longer, and would make it easier to wash? And what if this product didn’t have to be applied every 1-3 months? 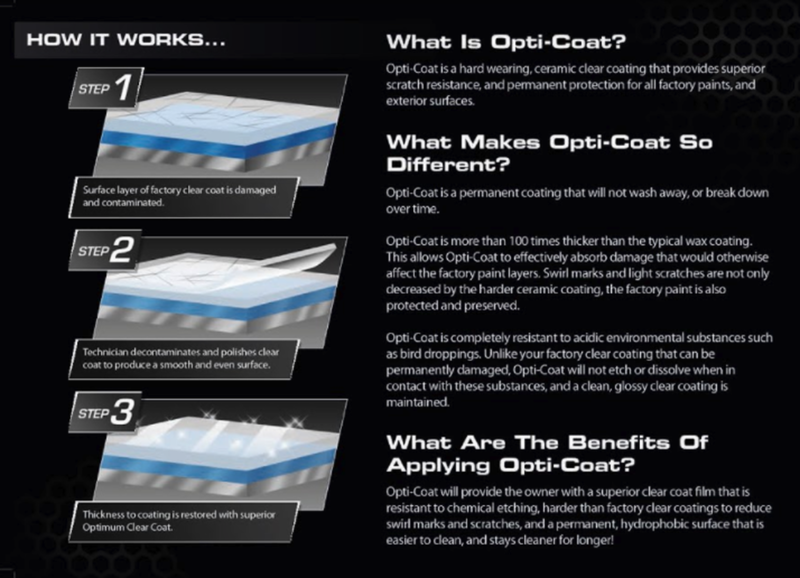 WHAT ARE THE BENEFITS OF OPTI-COAT PRO+? A quality Ceramic Coating like Opti-Coat Pro+ creates a permanent hydrophobic surface over your vehicle’s factory clear coat. This hydrophobic surface makes it more difficult for dirt, mud, and grime to bond with your car’s paint. As a result, your car stays cleaner for a longer amount of time. The hydrophobic surface created by Opti-Coat also means that when the time does come for a wash, your car will be easier to clean. Water will pick up dust or dirt and sheet off your paint. Opti-Coat Pro+ is about 100 times thicker than a traditional wax. That means it provides substantially more protection than a normal sealant. In particular, Opti-Coat Pro’s chemically resistant surface helps mitigate stains and etching caused by environmental contaminants like bird-droppings or bug-splatter. Even with Opti-Coat on your vehicle, it is still important to remove naturally acidic contaminants from your paint as quickly as possible. Nonetheless, your layer of Ceramic Coating will minimize damage and help protect the factory paint and clear coat underneath. Another potential danger for your paint is oxidation caused by UV exposure. This results in a faded look to your paint. Opti-Coat Pro+ is UV resistant, meaning that your paint will be protected from fading. 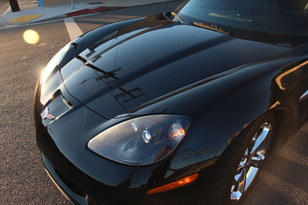 The ultra smooth surface that Opti-Coat creates enhances the reflective properties of your car’s paint. The result is that your car will really pop with gloss and shine. Especially after a fresh wash, your car’s paint will have that beautiful just-been-waxed kind of look, without having to spend time applying wax! Opti-Coat Pro+ does all of this with just one application! Unlike a traditional wax or sealant, Opti-Coat Pro+ does not was away or break down and does not require repeated application every few months. After one application of Opti-Coat, your vehicle experiences all of the above benefits for up to 7 years. 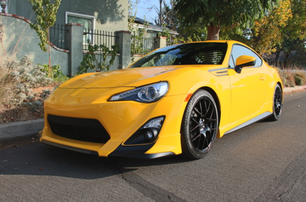 Will a Ceramic Coating eliminate the danger of scratches, rock chips and swirl marks? 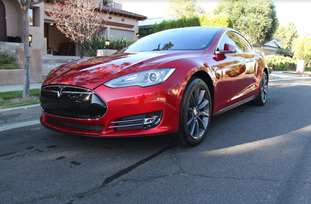 Is a Ceramic Coating an alternative to Paint Protection Film?